Last Autumn I reviewed a phenomenal book called ‘The Father’s Kiss‘ (Tracy Williamson), which communicated so well the depth of God’s love for us. It was reassuring and challenging in equal measure! With Valentine’s Day approaching, I thought it would be great to revisit the idea of God’s love, and what better way to do that than to invite Tracy to share with us? Welcome Tracy! It’s great to have you here on Desertmum. Can you tell us a bit about yourself? Hello, thank you for having me on here. I am single and live near Tonbridge in Kent, sharing a home with my blind friend and ministry partner, gospel singer Marilyn Baker. I am deaf and partially sighted myself so we make quite a team! We both have assistance dogs, mine being a hearing dog called Goldie and Marilyn’s being a guide dog called Saffie. I have always loved dogs so our two bring me great joy and a good excuse to get out walking. Other things I love are reading, chocolate, meals out with friends, hot baths, the beauty of creation. I have lots of loves….! What do you do in your work life? Marilyn and I work together for the charity MBM Trust travelling around the country giving concerts and leading conferences and renewal days. I also write, and my latest book The Father’s Kiss was released in September 2018. When and how did this book start to come about? The idea came to me in 2013. I was away on a retreat and was praying for guidance as to whether I should try to write another book. I had written some previously about listening to God, but had lost my confidence. On the second day the Lord put in my heart, ‘receive the Father’s kiss.’ What did that mean? As I continued to pray I felt God was saying He wanted me to go deeper into what it means to be loved by Him, to open myself to experience His affection and delight. I knew this was needed as I still had many barriers in my heart because of deep struggles in my childhood. I started to pray along those lines and God spoke again saying that He wanted me to share my discoveries of His Father love in a book. I felt daunted, I didn’t even know if I should still be writing let alone writing about something so emotive. I prayed He would confirm it. I was stunned! There was my confirmation that I should go ahead with trying to write another book, but what about the theme? Did God really want me to write about the Father’s Kiss? I prayed again for confirmation and a few days later when I was back at home and attending my church I was shocked when my pastor who also leads worship suddenly came back to the front mic and said that God wanted us all to experience the Father’s kiss! He talked for about 15 minutes about how the Father loves us and wanted to kiss us with His affection and deep care. I was astounded and overwhelmed and knew that God had answered my prayer for confirmation in a way that I couldn’t ignore. Can you tell us a bit about the journey to publication? It took me approximately four years to write it plus another year waiting for its publication. I didn’t have a publisher until 2017 so didn’t have a deadline to aim at – and, to be honest, still found the idea of writing it emotionally demanding. The whole process became a roller coaster of memories exposed amidst new discoveries about God’s love. It was exciting yet scary too and I didn’t know if I would even find a publisher and felt too daunted to try to self publish. Months went by without me writing but then God gently nudged me to start again. I became friends with another deaf writer called Emily Owen who had just released her wonderful memoir, Still Emily [Desertmum says: This is on my to-read list!]. As I read it and chatted via texts with Emily I felt inspired to persevere with mine. I prayed the Lord would help me to find a publisher and felt Him encouraging me to try Authentic who publish Emily’s devotional books. And that was it, the door was opened and they accepted my manuscript. I was amazed and so thankful to the Lord for His guidance and that he’d provided a wonderful friend in Emily too. In some ways the idea that God loves us seems very basic. Why write a book on it? It is basic but for so many, what we know in our heads doesn’t go down to our hearts, often because of past hurts. There are unlimited things we can teach on from God’s Word but the heart of the Gospel is love, God’s love for us and His desire for us to know we are His beloved children. How can we get to that place, especially if we have been hurt in life? It can seem impossible, but God can do it and is always working to break down our barriers and heal our hearts. I believe His love is one of the most important things we can ever focus on in our lives. Why do we struggle to accept God’s love? Our childhood hurts, our wrong choices, the negative things we’ve done or experienced including words we’ve heard about ourselves, all affect our sense of identity and self esteem. We feel worthless and, despite it being clear in God’s word that He forgives us unconditionally through Jesus, the old lies and negative feelings are like strongholds within us. And we can’t just look in God’s face to see His smile or hear Him chatting to us like our friends so we have to accept His love by faith which can seem impossible. But once we take that step, it’s amazing how He enables us to hear His voice and to experience His love as a reality not just an idea. This is what the book is all about, that all of us can experience His love, whatever has happened in our lives and however impossible it may seem. If He has enabled me to know He loves me He will do the same for us all as He has no favourites and longs for each of us to know we are His beloved child. Your book is really prophetic – not that it felt unplanned, but that there were regular interjections to share prophetic pictures and words which were refreshing and often challenging. Can you tell us a bit more about the prophetic nature of your writing? I love to hear God’s heart for people and often share prophetic words and pictures at the events I lead with Marilyn, but this book was a new experience in that I kept sensing Him giving me words and insights as I was actually writing. So, for example, I would share a teaching point or tell a story and suddenly have this overwhelming sense of God’s compassion filling my heart and as I prayed into that, it would become a prophetic word or picture that I knew He wanted me to include. It made me feel very humble that He would choose to speak through me in this way and also made me realise how important the writing process is, that He is in the actual process of creating the book, not just in the overall message or the finished product but in the whole. It made writing the book a real journey of faith and experience of His love because the words spoke to me and brought me healing as much as to any possible readers. What is your prayer/dream for this book and those who read it? I long that it might help many people discover how deep and personal Father God’s love is and that they will be enabled to go deeper into their heart, knowing of His love and also experience healing and transformation of inner hurts and wrong beliefs about themselves. I am praying that those who read it and are blessed will pass the word on about it and that its message will be spread and it will get into the hands of all who need its message. I also long that more and more will be empowered to give His love away to others – that there will be a domino effect of people receiving God’s kiss of love. It probably seems hard to look past this book right now but do you have any more ideas for future writing? Since the book’s publication, I have written a series of Bible notes for Day by Day with God (BRF) which will be in the Winter 2020 edition. In January, I started writing a 40 day devotional for River Publishing which was agreed before The Father’s Kiss was accepted for publication. Now that’s complete, I hope to write more for Authentic and am toying with a few ideas, even possibly a follow-up to The Father’s Kiss from the perspective of the child – but that is just an idea, so nothing concrete yet. I would love to write my own story and would also love to try writing a novel, but all in His time! I would appreciate prayer to know the right way to go and for things to fall into place just like they did with this book. Thank you so much Tracy for sharing some of the ‘behind-the-scenes’ work of your writing! You can read my review here and order The Father’s Kiss here. 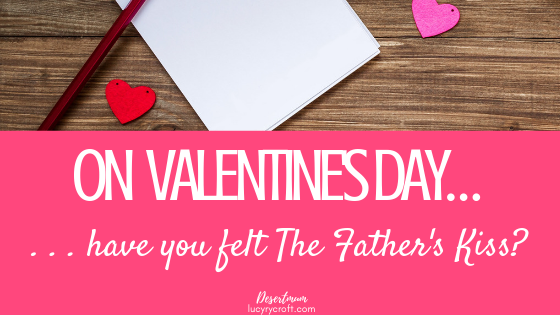 I’m running a Valentine’s giveaway this Friday exclusively for my Desert Tribe email list, and a copy of The Father’s Kiss will be included in the goody bag. If you’d like to win, make sure you sign up here so you don’t miss the email about how to enter – you’ll even get my free ebook ’15 Spiritual Practices Every Tired Parent Needs To Know’ when you do! If you’re already part of the Tribe, look out for Friday’s email!